Chicago Tribune: - On Saturday, 19 suburbs in DuPage and Cook counties will collect used cooking oil to convert it to clean-burning biofuel. School and Community Assistance for Recycling & Composting Education, or SCARCE, a Glen Ellyn-based environmental education nonprofit, organized the collection with oil recyclers Green Grease Environmental and Chicago Biofuels. Recycling cooking oil is a "win-win-win," SCARCE founder Kay McKeen said. "It saves residents and cities money, keeps water cleaner and generates clean fuel." Though she hopes more communities will begin offering year-round oil recycling, McKeen said she decided to start with Thanksgiving because so many families deep-fry their turkeys, each using about 4 gallons of oil. Even though these types of projects remain fragmented across the US, the efforts to manufacture more biofuels are paying off. 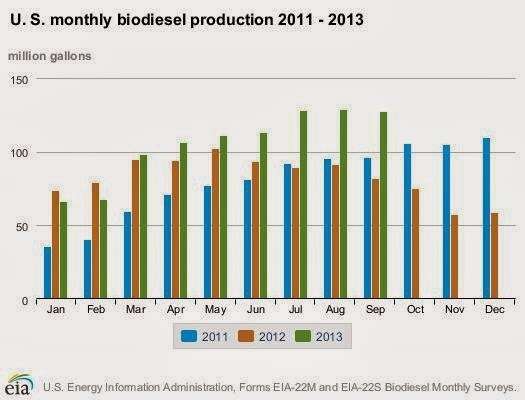 The latest data show biodiesel production at record levels. And while it may take decades for biofuels and other alternatives to rival fossil fuels (see post), your Thanksgiving turkey oil should still help.